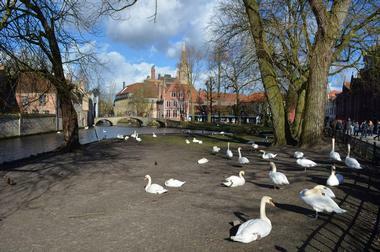 Bruges, located in northwestern Belgium, is the capital of West Flanders. This ancient city is characterized by its medieval architecture, cobbled lanes, and romantic canals and is the self-proclaimed Venice of Belgium. Stadhuis, the Gothic town hall, in Burg Square is probably the best place to start a visit to get a sense of the local history. 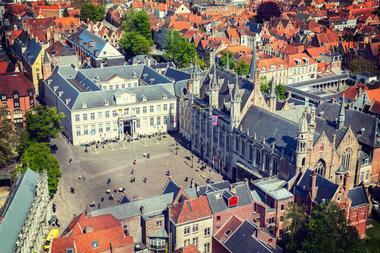 Markt – the Market Square – is an alternative start to an exploration of Bruges. An exceptional piece of preserved history, this square was once the scene of local happenings as diverse as medieval festivals and executions. The belfry is the highlight of Markt and a must-see. Visitors can best experience the charm of Bruges by beginning with these 25 things to do and see. 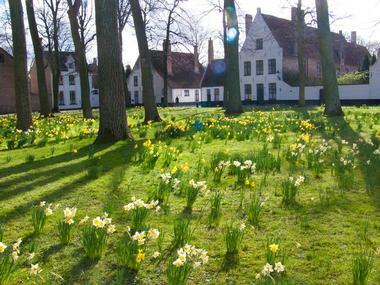 Located in Belgium’s Flanders Region is the Flemish Beguinages, a collection of 13 sites that highlight the cultural traditions of the beguines, a group of unmarried or widowed women who chose to dedicate their lives to God without removing themselves from the outside world. During the 13th century they established the beguinages, or closed neighborhoods, specifically designed to cater to their material and spiritual needs. These communities were surrounded by walls or deep ditches with a single gate that would remained open during the day. The interiors were designed based on the cultural regions they were constructed in, rural or urban, and were comprised of ancillary buildings, churches, houses, and green spaces. The Belfry of Burges is one of the most prominent towers in the city, standing at a towering height of over 270 feet. It’s most important fixture is the carillon, a collection of 47 harmonious bells. Visitors will have to climb 366 steps before they reach the top, but when they do they’ll be treated with unforgettable, picturesque 360-degree views of the city and surrounding area. Before making the lengthy climb, visitors will learn about the tower’s history in the reception area. On the way up they’ll stop by the old treasury, where the city’s public funds, seal, and charters were held during the Middle Ages, and the carillonneur’s chambers. The Boottochten Brugge boat tours are a must-do attraction when visiting this historic city, offering 30-minute boat trips along the famous canals of this self-proclaimed Venice of the North. Many of the places the tour passes by are locations that can only be seen via a boat, including historic buildings and churches. The tours cruise down the Spiegelrei toward Jan Van Eyckplein, passing by interesting buildings such as the slender tower of the Poortersloge building. The tour guides are extremely informative, witty, and entertaining and offer a wealth of information about each of the ancient sites as they’re passed by. Tours are given in English, Dutch, German, and French. Boudewijn Seapark is one part amusement park and one part aquarium, featuring a wide array of attractions. 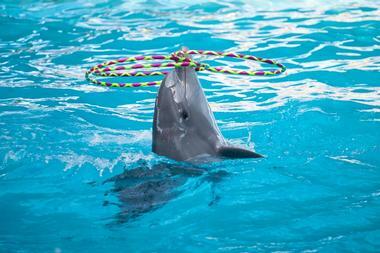 Their dolphinarium is the only one of its kind within the country, housing six bottlenose dolphins, which put on performances daily. Sea lions, seals, and birds of prey also call this park their home. In addition to the marine animals and amusement park rides such as Hurricane, Orca Ride, and Pirate Ship Sancta Maria, there is also an 8,000-square-foot indoor playground featuring 15 attractions, like inflatable bouncing castles, a carousel ride, and a 16-foot-high volcano called a klimvulkaan. There are various restaurants, a mini golf course, a mini farm, and a seasonal skating rink. Many people consider Bruges to be a grand open-air museum filled with secret hideaways and unique attractions, but its best-kept secret is its world-class beers. This medieval city is centered on 25 beer and beer brewing tales, making it the ideal location for a captivating beer tour. The tours last roughly 3 hours, taking visitors on a voyage into the past before returning them to the present. There are five distinct beer tastings as well as a complimentary BeerWalk glass. 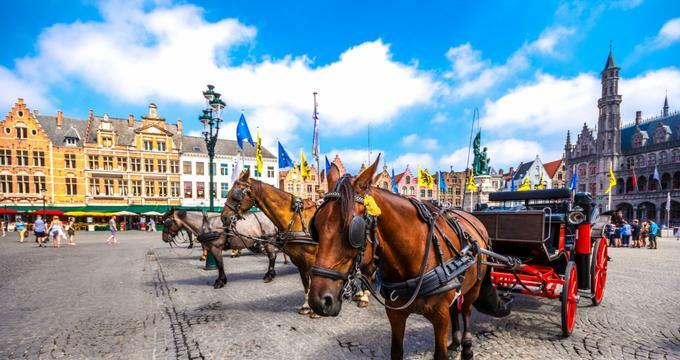 The walk begins at the Bruges Beer Museum and takes guests throughout the ancient town, where they taste delicious craft beers that hold historical significance from previous eras and attractions. 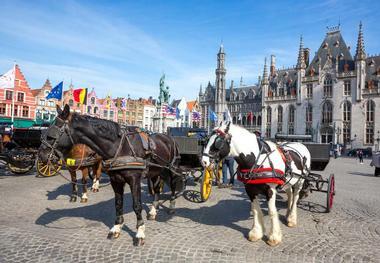 Taking a horse-drawn carriage ride through Bruges is one of the most romantic and informative ways visitors can see this ancient city. The tours begin in the heart of the city at Carriage Station and end at one of the legendary beguinage, a preserved medieval community that consisted solely of women who were widowed or unmarried and chose to dedicate their lives to God. Tours run along the majestic canals and an informative guide educates guests on the city’s historical roots while they pass by secret picturesque corners, ancient bridges, historic sites, and various museums. Night tours can also be booked. Large group tours are available. Burg Square is one of two medieval squares located within the city. It showcases various architectural styles including Gothic, Renaissance, and neoclassical. The latter is the style of the most beautiful and prominent building in the town, the Stadhuis Gothic Tower, which dates back to 1376 and is one of the oldest in the Low Countries. One of the tour’s most interesting buildings is the Basilica of the Holy Blood, the square’s smallest building. Its lower chapel is done in the Romanesque style while the upper chapel is in the Gothic style; the vastly different architectural styles make it extremely unique. Other key buildings include Bishop’s Palace and the Old Civil Registry. For a truly magical experience visitors should opt to take a canal trip on the whimsical river boat Lamme Goedzak, a 170-passenger steamboat that travels from the Norwegian Quay in Bruges to the Damme city center, where the legendary character Tyll Ulenspiegel hales from. 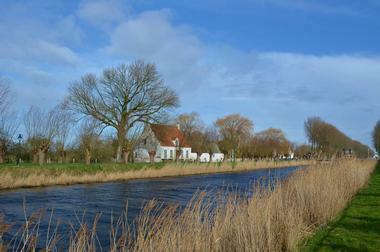 On the way to Damme, informative guides will tell Flemish tales of Nele and Tyll. Upon reaching the island, guests visit the extraordinary town hall and the Ulenspiegel Museum. Afterwards, visitors can enjoy wandering around the little town, stopping by bookstores, delectable restaurants, and unique pubs. There are even a few nature walks along various trails. The Chocolate Museum, also known as the Het Museum van Cacao, is a quaint museum featuring two floors of shops, exhibitions, and demonstrations. Upon entering the small museum, visitors will be immediately hit with the delicious, mouthwatering scents of melted chocolate. The first stop is the kitchen of the chocolatier, a Belgian chocolate maker, who provides a 15-minute demonstration on how pralines and seashell chocolates are made. Guests will watch in awe as melted chocolate turns into hard-shelled decadence. After the demonstration, guests can wander through the museum, learning fun and interesting facts about the history of chocolate making and its process through exhibitions and speaking with experts. The Ezelpoort, also known as the Donkey’s Gate, was built in 1297 during the development of the second ring of ramparts. In 1369 a new design was created and built by Mathias Saghen and Jan Slabbard, who also created the Smedenpoort and the Boeveriepoort. Between the 14th and 17th centuries the gate underwent several alterations. The 17th century alterations were significant, and completely changed the appearance of the Ezelpoort. Today, all that remains of the original gate is the brick gate’s lower section; the very top part of the structure was removed in the 17th century, making this once towering medieval gate much smaller. Volkskundemuseum, or the Museum of Folk Life, is a collection of eight 17th century almshouses. These single-room dwellings were used for various purposes during the 19th and 20th centuries. Among the eight almshouses, visitors will find a millinery, classroom, confectionery shop, pharmacy, grocery store, a Flemish living room, a bedroom interior, a tailor’s shop, cooper’s workshops, cobblers, and an inn. 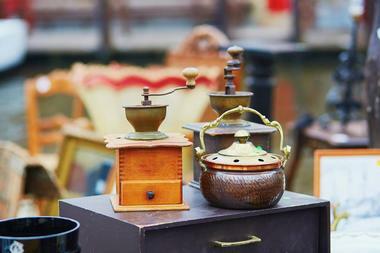 Each room contains traditional textiles, a wealth of authentic décor, and antique objects. De Zwarte Kat, otherwise known as The Black Cat, is a tavern located next to the museum detailing the history of the legendry Bruges puppet show, Den Uyl. The Groeninge Museum resides on the previous site of the Eekhoutabdij, the Eekhout Abbey, and was designed by prominent architect Joseph Vieren. 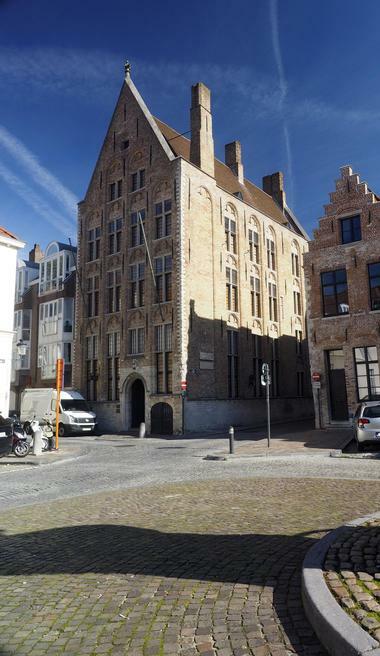 In 1995 the adjacent neo-Gothic building designed by architect Jean-Baptiste Bethune was added to the museum to create extra space for the collection of Bruges paintings that had previously been scattered throughout the city. Today, visitors can marvel at Flemish expressionism masterpieces, such as The Virgin and Child with Canon van der Paele, 18th and 19th century neoclassical paintings, and post-war modern art. Flemish primitive paintings are the collection’s focal point, with artwork from legends Hans Memling, Jan van Eyck, Gerard David, and Hugo van der Goes. 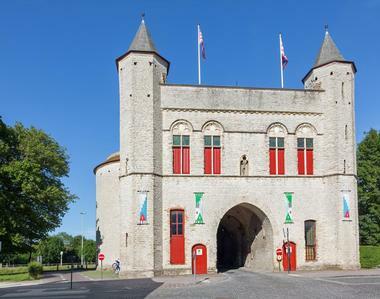 Kruispoort Gate was originally constructed between 1297 and 1304, at the same time as the second rampart. By 1366 it had to be rebuilt due to invasions and was all but destroyed in 1382 by the Ghent militia, led by Philip van Artevelde, when they captured the city of Bruges. In 1400 the gate was rebuilt for the third and final time, a design that utilized the only original pieces that remained. This included the two octagonal turrets, two heavy towers, and the narrow passageway. 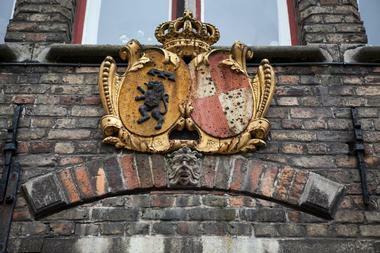 Throughout history the German army, the Holy Roman Emperor Charles V, and Napoleon used this gate to enter Bruges. 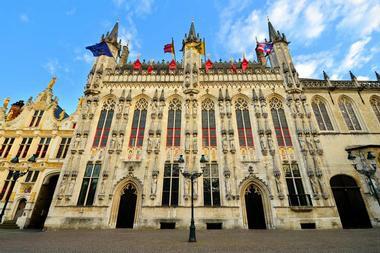 The Church of Our Lady is a beautiful piece of Scheldt Gothic-style architecture with elements of Brabantine Gothic and French design. It features a 370-foot-high brick tower, making it the world’s second tallest brick building. The church began construction in the 12th century and renovations of the building continue today. 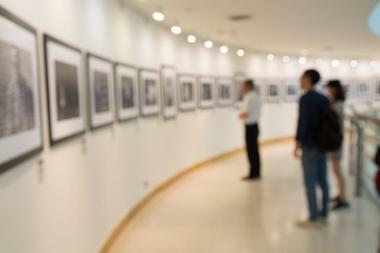 There is a wealth of interesting and valuable art pieces, such as the world-famous painting of Madonna and Child created by Michelangelo in 1505, painted 13th century sepulchers, and the 16th century tombs of Charles the Bold and Mary of Burgundy. An additional key art piece is the triptych depicting the Passion of the Christ created by Bernard van Orley. Markt, also known as the Grand Place and Market Square, is a roughly 2.5-acre square situated in the heart of downtown Bruges. 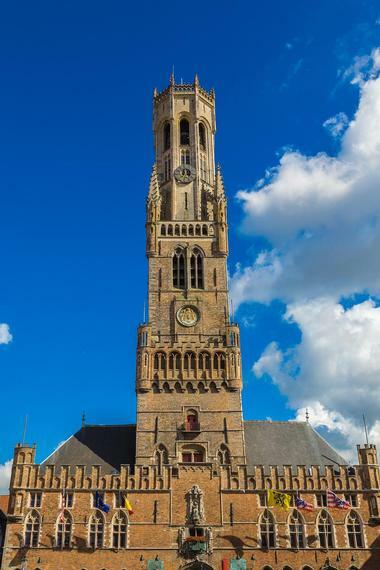 It’s a prominent fixture in the city and home to the most famous monument in Bruges, the 12th century Belfry Tower. This massive and equally impressive wooden tower was built in 1240 and rests on a brick building, making it a unique piece of architecture. The Belfry was previously the home of city officials who were in charge of the city’s important financial dealings. Today, visitors can still see the tower’s 47 bells designed by George Dumery in 1741. The square also features several additional architecturally significant buildings that are worth a visit. The Salvador Dali Exhibition is a small museum and gallery located in Market Square in downtown Bruges. It contains a permanent yet ever-changing display of obscure and lesser-known Salvador Dali paintings, sculptures, and drawings. The highlight of the museum is the collection of artworks in which Dali collaborated with Walt Disney in the creation of the film Alice in Wonderland. 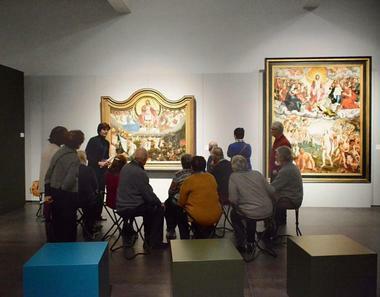 The tours are self-guided with the use of an audiotape that provides in-depth insight into Dali’s earliest artworks. As an added bonus, they feature a quaint gift shop that offers original quality and certified Dali paintings for purchase. 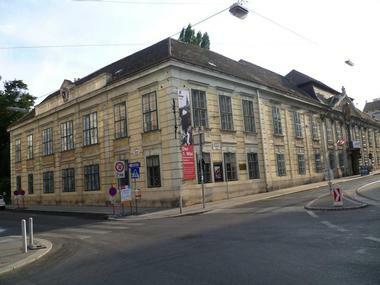 Saint John’s Hospital is one of Europe’s oldest exceptionally preserved hospital buildings and currently serves as a museum. This 800-year-old piece of history served as a care center for the sick, the poor, travelers, and pilgrims. Visitors will have the chance to tour the medieval wards where monks and nuns worked to heal the people of the city. Sint-Janshospitaal features a chapel, the Diksmuide attic, the custodian’s room, an old dormitory, a pharmacy, and an herb garden. There is also a remarkable collection of archives, medical instruments, and artworks, including six paintings created by renowned artist Hans Memling. 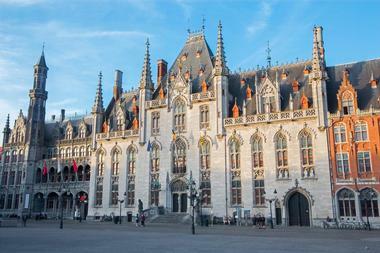 Stadhuis is Burges’ city hall and has been acting as the governing building for over 600 years. 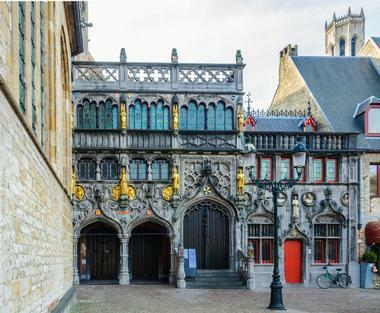 This Gothic-style structure was originally built in 1376, making it one of the oldest city halls in the Low Countries. It’s most prominent fixture is its Gothic Hall, featuring colorful vaulted ceilings, late 19th century murals, and a polychrome vault. On the ground floor visitors can enjoy a free multimedia exhibition that showcases the structural growth of the city hall and Burg Square. 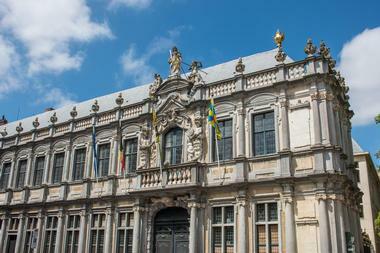 Visitors will also see historic objects and documents such as the great seal and a copy of the historical account of Galbert of Bruges. The De Oude Steen, also known as the Old Stone, is one of the oldest and most historic prisons in Europe. Its exhibition is both gripping and gruesome as it features the barbaric and vicious instruments created to inflict unimaginable suffering and pain on the human mind and body. There are over 100 execution and torture devices within the museum, presented in chronological and judicial order, providing visitors with an in-depth look into the origin and history of these terrifying instruments. 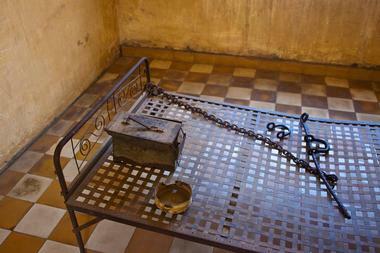 The museum also contains lifelike wax sculptures that depict the controversial use of these torture devices. The Chapel of Saint Basil was built in the first part of the 12th century and is the only Romanesque-style church in West Flanders. Derrick, Count of Alsace, designed the church and dedicated it to Saint Basil the Great. The chapel is broken up into two sections, the Upper Chapel and the Lower Chapel. Each chapel contains a wealth of ancient relics dating back to between the 12th and 17th centuries. There is a wooden polychrome sculpture of a seated Madonna and Child, two magnificent wooden statues representing Pieta and Jesus on the Cold Stone, stained glass windows, a white marble alter with the Holy Cross, and various historical wall paintings. 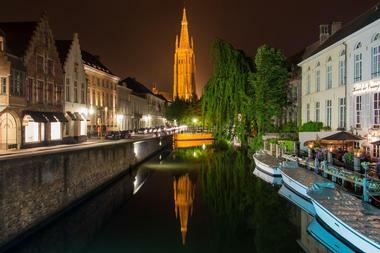 Bruges by Night is a free walking tour that offers visitors the chance to explore the city in a way very few have been able to do before. This donation-based activity takes guests on an off-the-beaten-path exploration where they’ll hear ancient tales as they discover the town’s hidden sites. Every night at 8:00pm the tour begins at the Grote Market and stops by Bourse Square, Augustine Bridge, Pottery Maker Street, Jan van Eyck Square, Ghost House, Golden Hand Canal, House of Purgatory, and the Long Canal. The tour also stops by St. Anna Quarter, Café Vlissinghe, St. Janshuis Mill, Jerusalem Church, and Cross Gate before finishing at the Bauhaus to enjoy a free beer. Can You Handle It? Tours, is an energetic tour company that provides an array of paid beer tasting and pub crawl tours as well as free, donation-based walking tours throughout Bruges, Ghent, and Cologne. 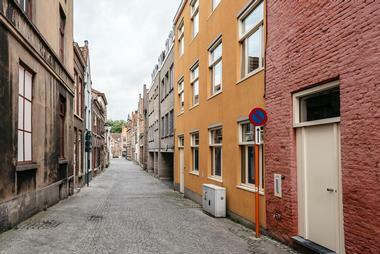 Brugge is one of their free walking tours where informative guides take you through the city, detailing everything from its history to entertaining movie facts. Each walking tour makes several stops at places for cheap drinks and free Belgian food. The two additional Belgium tours include the Brugge Pub Crawl, which stops by five unique pubs, and the Belgian Beer Tasting tour which consists of learning about the city’s beer culture while tasting five distinct Belgian beers. 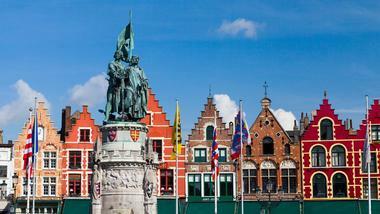 Legends is a tour company that offers numerous paid and free tours throughout the city of Bruges. Among the choices are the Belgian Beer Tasting tour, Bruges to Damme Bike Tour, Bruges at Night free walking tour, Flanders Experience Tour, and Legends of Bruges free walking tour. The latter is one of their most popular tour options. Visitors will meet at the statue in the main square to explore the historic city center with expert guides who bring this fascinating city to life through tales, urban legends, and descriptions. They also show guests where In Bruges was filmed, and provide them with tips, discounts, and a must-do activities list while in Bruges. 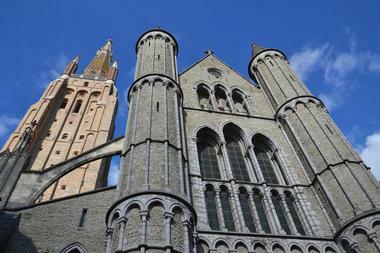 Photo Tour Brugge is a tourism company that specializes in photography tours around the streets of Bruges. 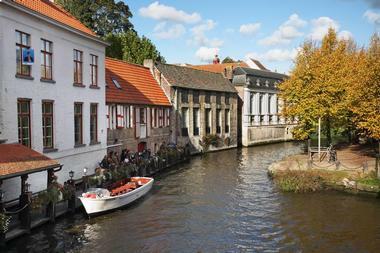 Among the choices are Edges of Brugge, which takes visitors along the side streets and the city’s quiet canals, and Essential Brugge, which focuses on the city’s prominent sights and city center. There are also two additional tours. Hidden Brugge is centered around quiet local attractions in the late afternoon light, and Shades of Brugge is a blue hour and nighttime shoot. Tours are guided by local photography experts, and available based on level of expertise from novices to professional, lasting between 2 and 3 hours.